Today’s businesses attract new talent by making their offices fun places to work. Show your prospective clients your lighter side with custom-imprinted games from BRAVA. Who hasn’t had a day when he hasn’t felt the overwhelming urge to simply throw darts? 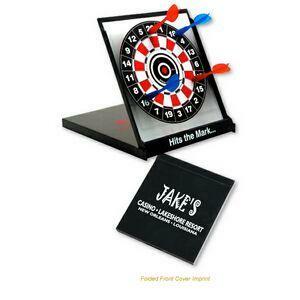 Now your potential clients can indulge that compulsion without danger thanks to BRAVA’s magnetic dartboard set.